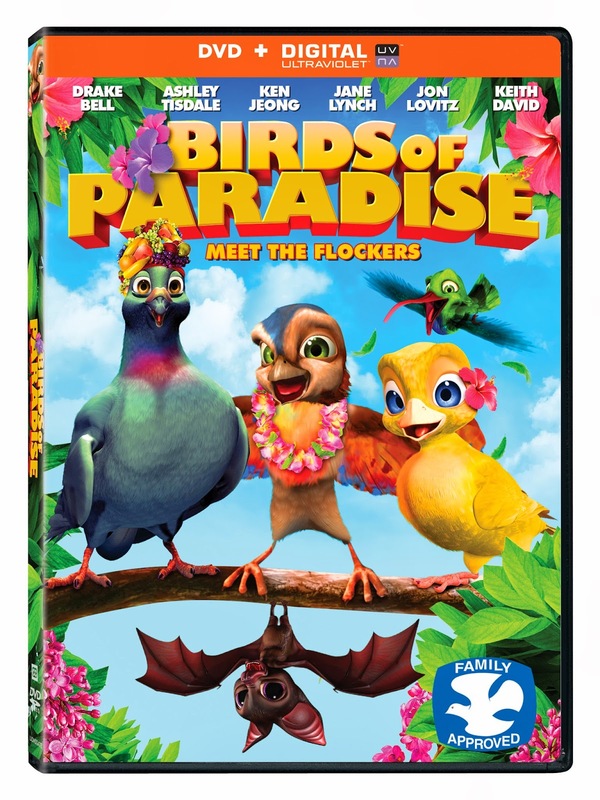 Why hide in a crowd when you were born to stand out with the high-flying adventure Birds of Paradise, arriving on DVD (plus Digital UltraViolet) in April exclusively at Walmart and Redbox from Lionsgate Home Entertainment. The film will be available on Digital HD, Video On Demand and Pay-Per-View everywhere the same day. Awarded the DOVE seal of approval, this family-friendly adventure proves you shouldn’t judge a bird by their feathers. When Jack, an ordinary sparrow with dreams of becoming an extraordinary bird, is accidently covered in colorful paint, he is thrilled about his new exotic appearance and believes that he’ll now be able to impress Aurora, a beautiful canary who has recently escaped from her indoor cage. But when Aurora’s mean owner, Mr. Potter, finds her, Jack must enlist the help of his best friends - Vinnie, the loyal pigeon and Skeeter, the hyper hummingbird as well as Rosie, the caring bat and the wise Old Buzzard in order to free her. And along the way, Jack and Aurora will learn that it’s not what you look like on the outside, but who you are on the inside that truly counts. This movie was super cute! The characters were fun and lovable. I really enjoyed the fact it taught my kiddos that its who you are on the inside that matters. It also taught them about teamwork and about helping out others. My kids enjoyed the movie and both of them instantly fell in love with Jack and his quest to impress and save Aurora!